This 10th century artificial water reservoir was built by King Suraj Pal of Tomar Dynasty. Situated on the laps of Aravalli hills, Suraj Kund is most famous sightseeing in Haryana. Since the Tomar King is die hard devotee of Sun God, he has named the reservoir as Suraj Kund (Sun Tank) and also built a shrine for Sun God nearby the Suraj Kund. Also Anagpur Dam is just 2 km away from Suraj Kund. The local stream which first feeds the Anagpur Dam later fills up the Suraj Kund. If we look at the shape of the reservoir, it resembles the rising sun. The embankment structure makes you feel as if you are standing in a amphitheater. The tank sprawls over 99 acres. It will be fully filled up in monsoon and dried up in summer. 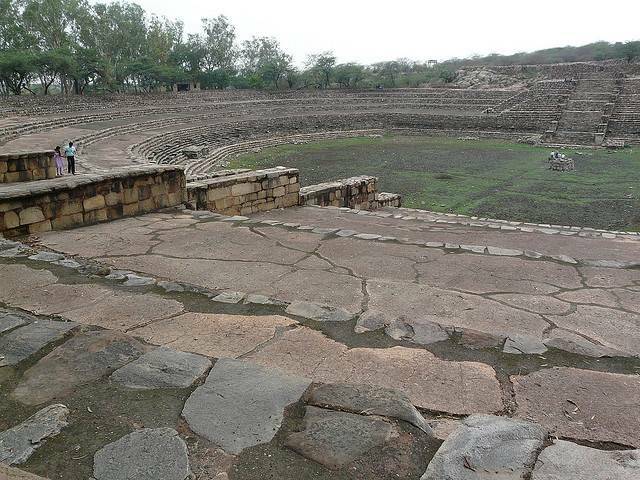 This Suraj Kund was part of hunting resort in ancient times.